Since the introduction of iOS and Android in 2008, mobile apps have grown to become the primary interface to computing resources. In 2016 more people accessed the internet via mobile than desktop. This has led to explosive growth in the development of mobile apps, with more than 5.2 million iOS and Android apps available at present to download. Unfortunately for most developers, this makes it extremely challenging to get their apps noticed, with typically only as few as 5% of their target audience actually using their app. Compounding this is the development costs involved - on average around $250k per enterprise app, often exceeding AUD $600,000. There are common factors that lead to apps not being successful, ranging from poor user experience, to technical issues and security concerns. Fortunately there are several basic strategies that can make an app useful, engaging, and more likely to be adopted and retained. Well designed enterprise apps can interface with systems of record to improve internal business processes, increase productivity, improve customer service, and help to cut costs. 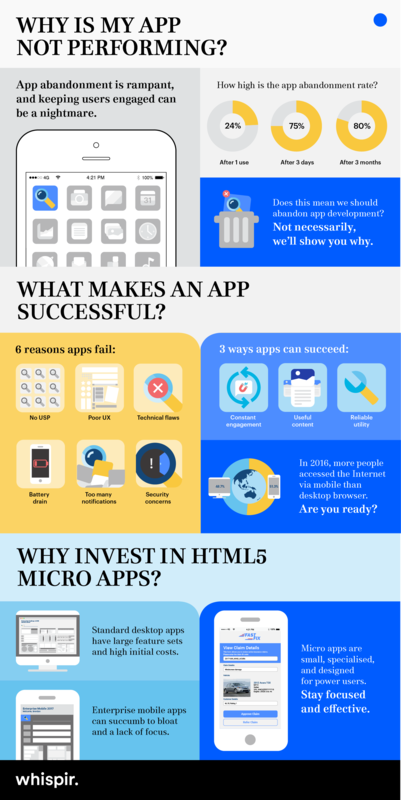 Smart communications platforms can deliver a fully fledged HTML5 micro app to the end user, without needing to have the software pre-installed, using the workflows already developed to maximise the development investment.